From the dazzling pink lake in the Dominican Republic to ice-blue Crystal Caves in Iceland to the mind-blowing deserts of Ethiopia to rainbow-hued mountains in China and the colorful city in India Jaipur. Some places are so lively that they look illusionary. Here are some most colorful cities in the world. 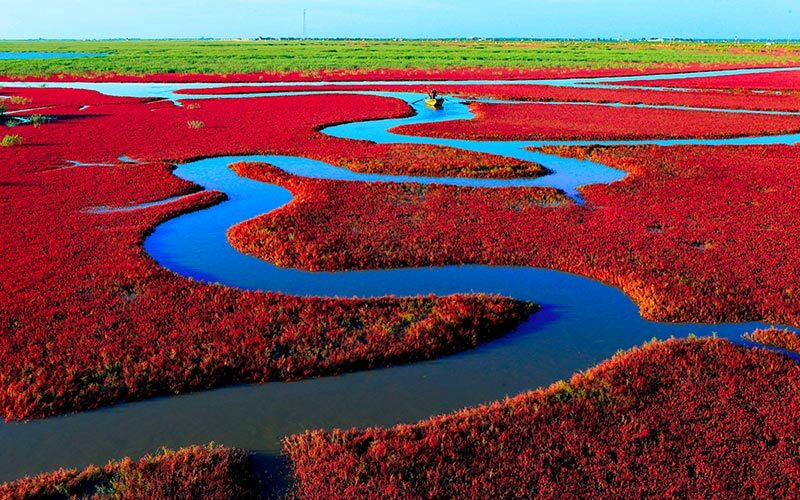 This Beach painted in red color is located in the world’s largest wetland and Reed Marsh. The designated beach receives its color from a kind of seaweed which grows in highly alkaline soil. Seaweed grows every year in April or May and in the autumn it turns its shade into a dark red color. Other Top Attractions near Panjin Red Beach, China: Red Sea Beaches, Shuangtaizi Estuary Waterfowl Nature Reserve, Liaohe River Estuary Reed Sea Wetland Landscape, Lakeside Park in Panjin City. Best Time To Visit: Mid-September to Mid-October. Panjinhong Beach is open from 8:30-17:00. After mid-October, it starts turning into the purple shade. The largest hot spring in the U.S. is the Yellowstone National Park‘s Grand Prismatic Spring which is also the third largest in the world. In addition, hot-spring rainbow rings have inspired it to become Yellowstone’s most photographed thermal feature. These colored bands get their shades from various species of heat-loving bacteria that grow in the spring. Other Top Attractions Near Yellowstone National Park, USA: Upper Geyser Basin and Morning Glory Pool, Hot Springs & Minerva Terrace, Tower-Roosevelt & the Lamar Valley, Mount Washburn, Hayden Valley, Mud Volcano. Best Time To Visit: April to May and between September and November. Zhangye Danxia National Park is spread over 200 square miles in northwestern Gansu Province of China and in 2009 it has been listed as World Heritage Site since by UNESCO. 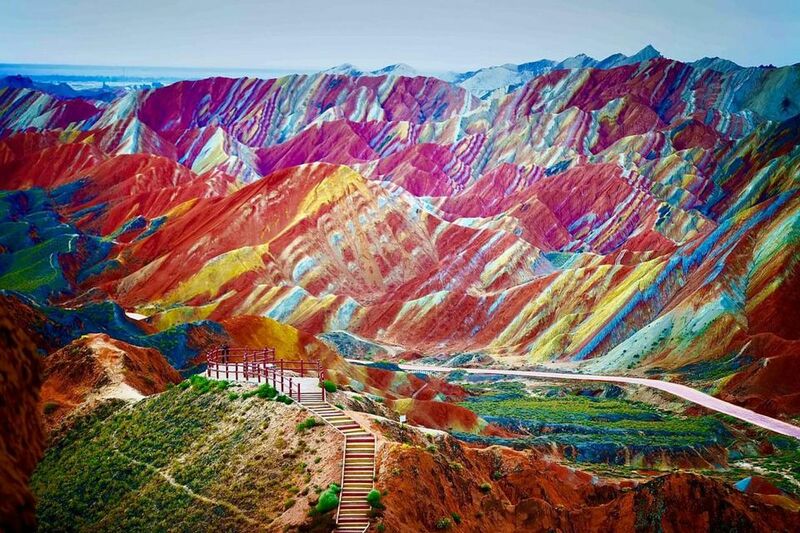 They are considered as one of the most colorful places in the world. The mountains have colorful sandstone and an array of minerals. If the weather is temperate, just enjoy the sight from June to September as at the time of even little raindrops with the strong sun rays flashing into those water drops emerges out in the stunning shades of colors. Other Top Attractions Near Zhangye Danxia, China: Shuangquan Lake Tourist Area of Linze. Daigo-Ji is also in the named World Heritage Site and is considered as National Treasure of Japan. Shingan Buddhist Temple is located in the southeast of Kyoto on the mountain base. The beauty of the temple is enhanced more when brought together with the area’s alluring greenness. 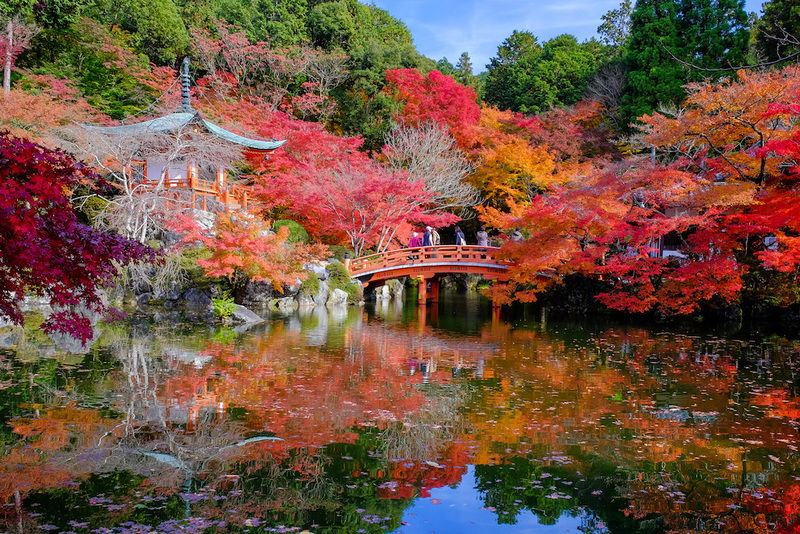 Other Top Attractions In Kyoto, Japan: Daigo-Ji Temple Karamon, Daigo-Ji Temple Niomon, Daigo-Ji Temple Bentendo, Daigo-Ji Temple Goju Tower, Fushimi Inari-Taisha Shrine. Best Time To Visit: Late October and November. The Central Park of New York has been featured in endless movie and television cameos. The iconic New York park has an area of 843 acres between Upper West Side and Upper East Side of Manhattan which calculates to 6% of Manhattan’s total expanse. In 1962, the park was designated a National Historic Landmark. 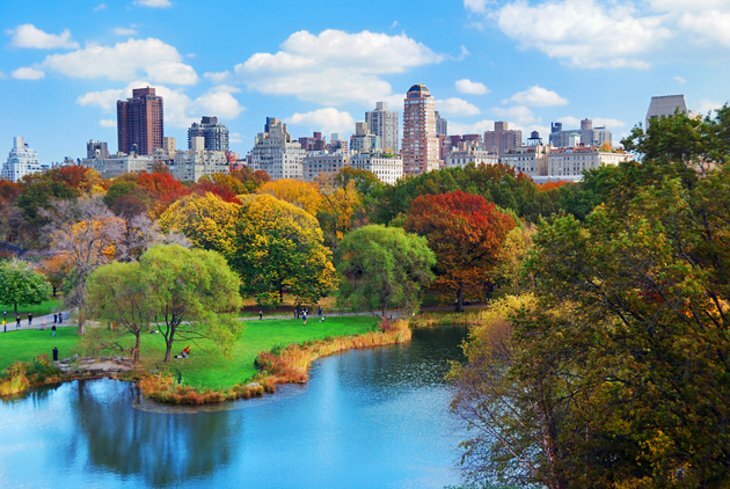 Other Top Attractions In Central Park, UK: Belvedere Castle, Central Park Zoo, Strawberry Fields, Bethesda Fountain and Terrace, Conservatory Garden, The Mall and Literary Walk, Ice Skating. 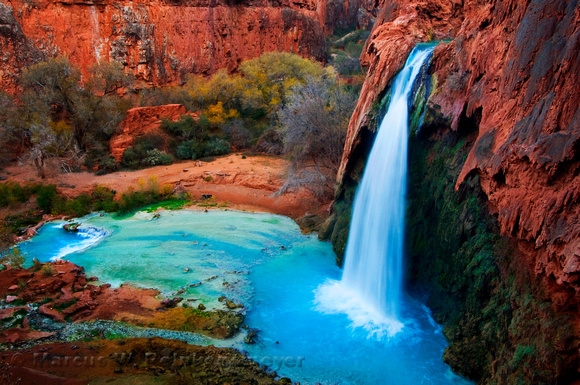 Havasupai Falls are having a picturesque view in the Arizona region of the Grand Canyon. The exquisite fall is known to one of the most colorful places to visit. The falls are blessed with stunning turquoise shade falling down from the beautiful orange-red rocks of the Grand Canyon make it a popular destination for hikers and photographers alike. Other Top Attractions Near Havasupai Falls: Havasu Falls, Navajo Falls, Mooney Falls, Havasu Canyon, Thunder River Trail, Hualapai Hilltop to Supai Trail. Best Time To Visit: The best time to see the waterfalls is the month of Spring and the North Rim of the Grand Canyon is closed until May 15. Bluewater all around the planet! This thing does not apply to the Lake Hillier which is located on Middle Island in Western Australia. The place, because of its astonishing river is known to one of the world’s most colorful destinations. The lake has got its color due to the mixture of two things, one is high salinity, an algae species called Dunaliella salina and a pink bacteria called halobacteria. 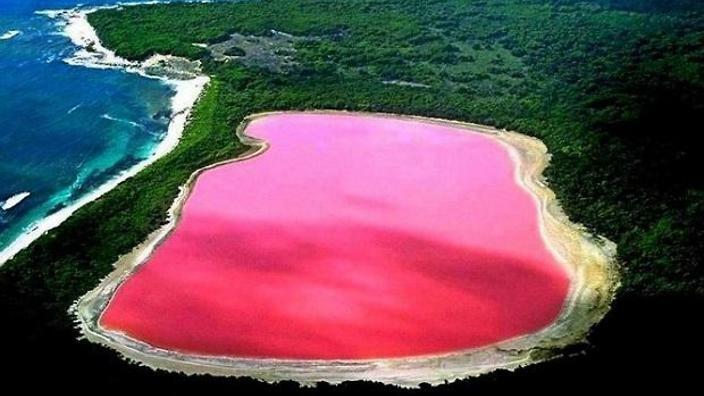 Other Top Attractions In Lake Hillier, Australia: Hutt Lagoon, Recherche Archipelago, Cape Le Grand National Park, Stokes National Park, and Cape Arid National Park. Best Time To Visit: Scenic helicopter flights operate every day between October to April. Also Read: These Insanely beautiful Flowers Will Make You Go Jaw-Drop! The garden is a dwelling to 20 different species of the wisteria flowering plant which comes in different hues of white, blue, purple, violet-blue and pink. This private garden finds its place in the south of Kitakyushu which is open to the public seasonally during the wisteria season from mid-April to mid-May and in autumn, the maple leaf season. 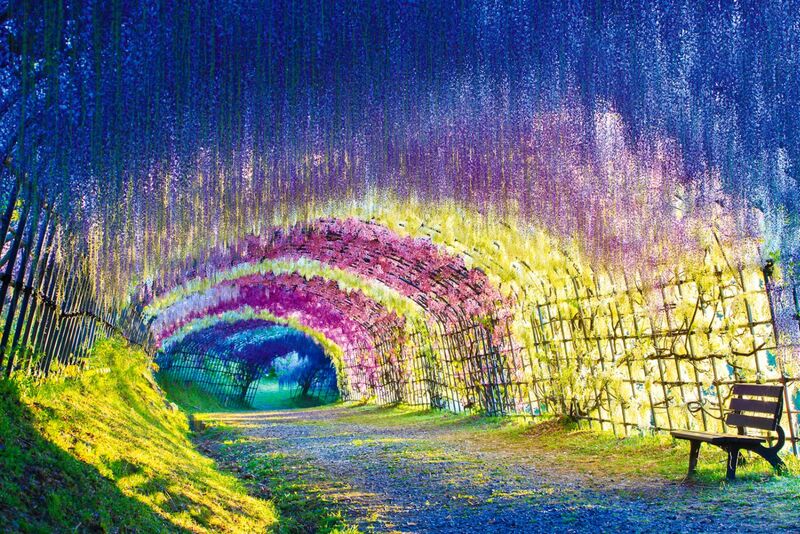 Wisteria flowers’ tunnel is the main attraction of the garden. The place is famous is known to be the world’s most colorful places. Other Top Attractions Near Kawachi Fuji Garden, Japan: Ajisai no Yu, Sarakurayama Cable Car, Mt Sarakura, Kitakyushu Museum of Natural History & Human History, Mount Sarakura Visitor Center, Kokura Castle. Best Time To Visit: Beginning of May. Hani people had built Yuanyang Rice Terraces in the slopes of Ailao Mountain about 2,500 years ago. The unique technique that was used for the development of fertile land in the mountainous region not only helped the Honey people to cultivate rice as an industry but transformed a mountain into a splendid piece of art which is still standing and the by UNESCO it was designated as a World Cultural and Natural Heritage Site. 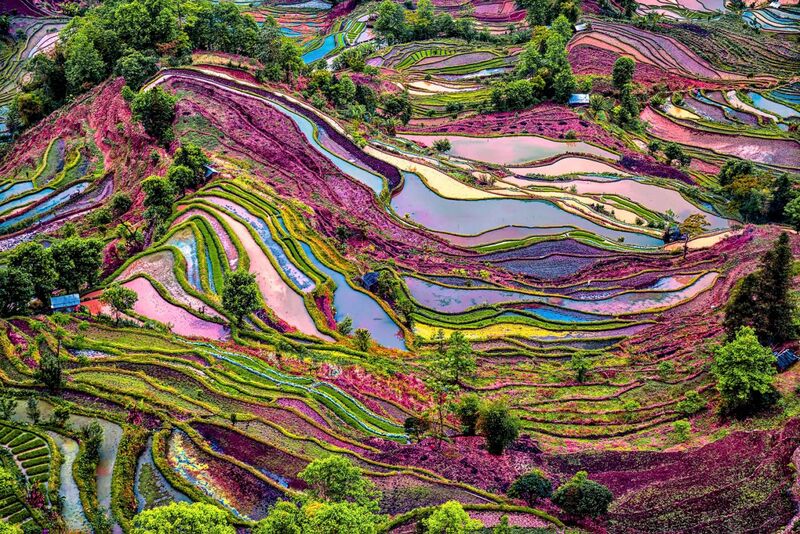 Other Top Attractions Near Rice Terraces, China: Duoyishu, Mali Village, Mengpin Terrace, Original Pottery Village, Nali Village. Best Time To Visit: November to the next April is the best time to have the glimpse of the most amazing terraces. 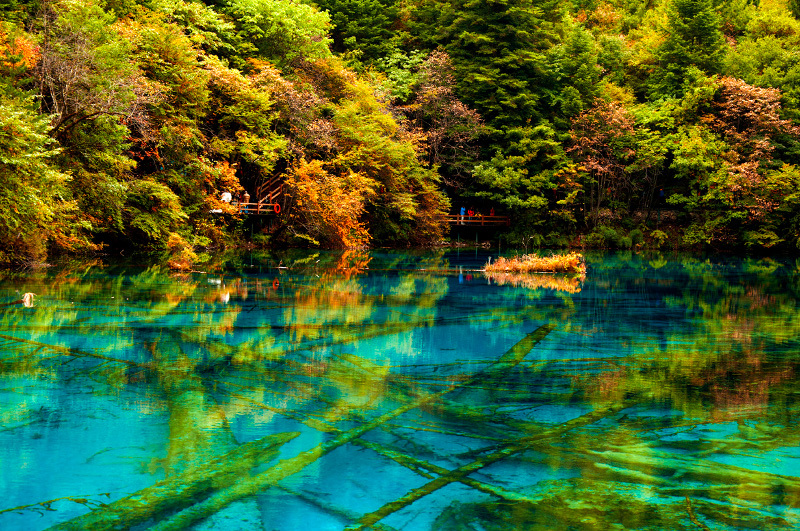 This beautiful lake is found in Jiuzhaigou National Park of China, in the Sichuan province. The water here contains a variety of shades of blue, dark blue, green, yellow and red, the different hues are because of the minerals present in it, namely calcium carbonate, and aquatic plants. Other Top Attractions Near Five Flower Lake, China: Shuzheng Village, Shuzheng Waterfall, Nuorilang Waterfall, Pearl Beach, Xiniu Lake, Reed Lake. Best Time To Visit: From April to June the greenery is at its best and from July to August – the time is pretty good for witnessing the waterfalls. Northern Lights is one of the best places to see this natural wonder is in the bright oval in Northern Norway. In between late September and late March, it is the best time when it is dark from early afternoon until late morning. Best places to see the Northern Lights in Norway: Tromsø, Lyngenfjord, Bodø, Lofoten Islands, Vesterålen Islands, Alta, Svalbard, Varanger, Narvik, Helgeland. These snowy caves find its place inside the Mendenhall Glacier, which is a 12-mile-long glacier in the Mendenhall Valley. 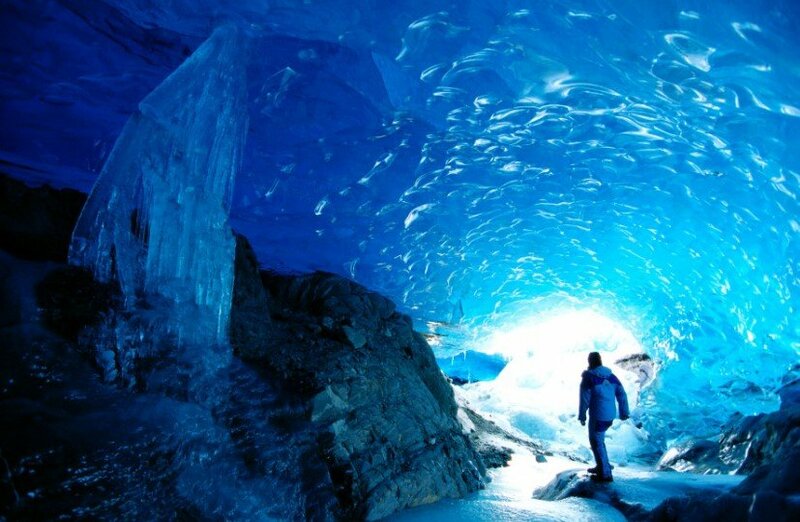 It is a popular tourist destination as these caves are only approachable to those who are willing to hike or canoe to the glacier. Things To Do At Mendenhall Ice Caves – Juneau, Alaska: Mendenhall Glacier Lake Canoe Tour, Mendenhall Glacier Ice Adventure Tour. Best Time To Visit: Between mid-May and mid-September. 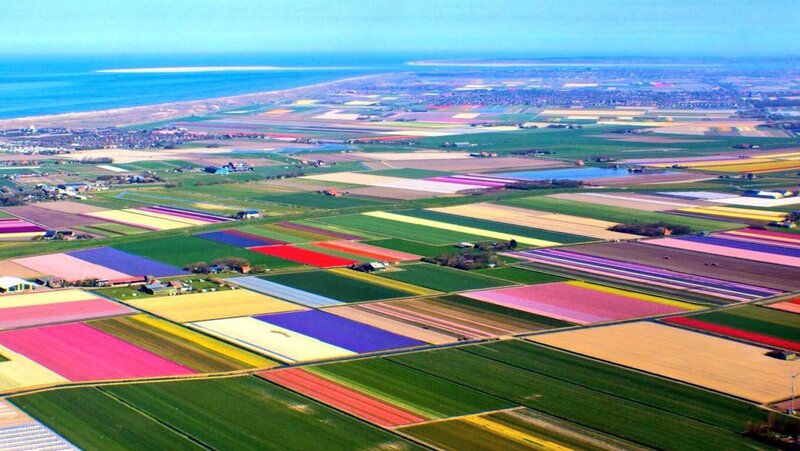 Spring arrives and multiple rows of tulip blossoms all around the Netherlands. During March or April, it is a pleasure to be in Holland for a lifetime memorable view. Other Top Attractions near Tulip Fields of Holland: Keukenhof Gardens, Noordoostpolder, Lisse, Noordwijkerhout. Best Time To Visit: The end of March until mid May; April is the most preferable season to see the flowers blossoming at their peak. This small street in northwestern Portugal. The great thing is it is already a popular theme of several Instagram posts, Kudos to the colorful umbrellas which provide shade to the passengers. Other Top Attractions Near Rua Luis de Camōes, Águeda, Portugal: OzXtreme, Praca Publica Bar, CAA Centro de Artes de Agueda, Alianca Underground Museum, Pateira de Fermentelos, Abrigo D’Aventura. This formation of sandstone is painted in hues of brick red and golden yellow. The waves change their color pattern quickly as the weather changes. It depends upon your visit at what time you go there, whether it is sunrise, sunset, or the dead of night. Other Top Attractions near The Wave, Coyote Buttes, Arizona, China: Kanab Western Adventures, Grand Circle Tours, South Coyote Buttes, Buckskin Gulch, House Rock Valley Road, Paria River Ranch, Nautilus Rock. Best Time To Visit: January to early February and between November and March. These muted in color buildings come from the sea in a stunning rocky view. The best views are in motion when the seashore lits up with the soft colors against the dark blue color of the sky at night. 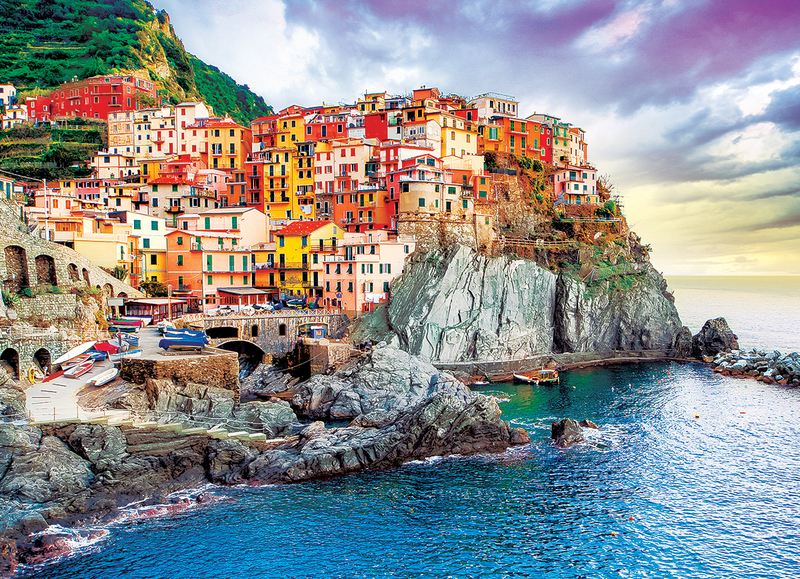 Other Top Attractions In Cinque Terre, Italy: Cinque Terre Trails, Footpath Monterosso – Vernazza, Monterosso al Mare, Manarola. Best Time To Visit: January, April, May, June, July, September, December. This decorative architecture is found in Moscow like no other you will come across. Add turrets and spherical design details with colored paint palettes and you’ve got a scene directly from a storybook. Russia finds its place in the most colorful places in the world. 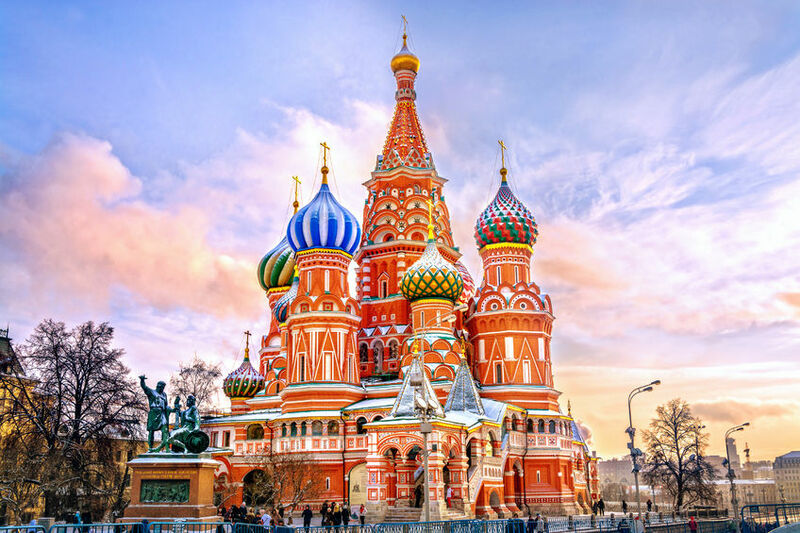 Other Top Attractions In Moscow, Russia: Red Square, St. Basil’s Cathedral, State Tretyakov Gallery, Moscow Kremlin.